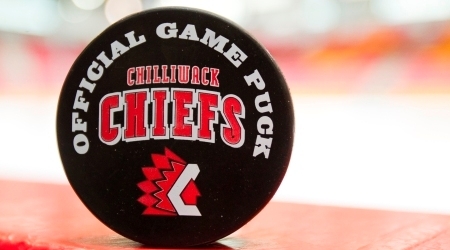 Chilliwack, BC – The Chilliwack Chiefs bottled up one of the BCHL’s most potent offences Sunday night, bouncing the Salmon Arm Silverbacks 4-1 at Prospera Centre. The Silverbacks skated into Chilliwack averaging 4.15 goals per game, second only to the high-flying Penticton Vees. But Colton Thibault was the only Salmon Armian to put a puck past Aidan Pelino as the home team played air-tight D.
Vimal Sukumaran led the Chilliwack’s attack with three goals as they won their sixth straight game and improved their overall record to 12-5-1-2. Jordan Kawaguchi got the scoring started in this one. The Chilliwack captain took a drop pass from Darien Craighead on the right-wing wall, cut into the high slot and ripped a top-shelf shot off the iron and in. His eighth of the year gave the Chiefs a short-lived 1-0 lead at 5:40. Less than three minutes later, Salmon Arm defenceman Phil Middleton pinched down the left-wing wall in the Chilliwack zone and threw a shot on net. Crease crashing Thibault pounced on the rebound, popping it past Pelino. Shots on goal through 20 minutes were even at 10-10. Sukumaran netted a pair in the middle frame to break this game open. The first came off an Olivier Arseneau shot. Camped to the left of the Salmon Arm net, Sukumarn snagged the rebound and threaded a sharp-angle shot through Salmon Arm netminder Angus Redmond. The second came with his team under siege late in the middle frame. Salmon Arm controlled play in the Chilliwack end for a good two minutes on a shift that looked like it would end with a Silverbacks goal or a Chiefs penalty. Kawaguchi ended the siege when he dropped to one knee to block a point shot, nabbed the puck and took off like a shot. Sukumaran got a step on his Salmon Arm defender through the neutral zone, took a pretty lead pass from Gooch, skated in on net and went with the forehand-backhand deke, slipping the puck past Redmond. His team-leading 16th of the year put him one off the league lead, co-held by Penticton’s Tyson Jost and Nanaimo’s Sheldon Rempel. With an army of NHL and college scouts in attendance, the Sukumaran show continued in period three. No. 11 in white scored his third of the game short-handed at 6:30. Austin Adam made a nice play to earn the assist, standing up a Salmon Arm rush in the neutral zone and springing Sukumaran on a breakaway. Redmond made the first save, but Sukumaran whacked away until the puck went in. Salmon Arm threw 10 pucks Pelino’s way in the final frame, most from the outside. The Ontario native stopped them all to secure his seventh win in 13 appearances. The three stars were Sukumaran (first), Kawaguchi (second) and Craighead (third). The Fortis BC Energy Player of the Game was Ryan Roseboom. Attendance was a season-high 2,893. 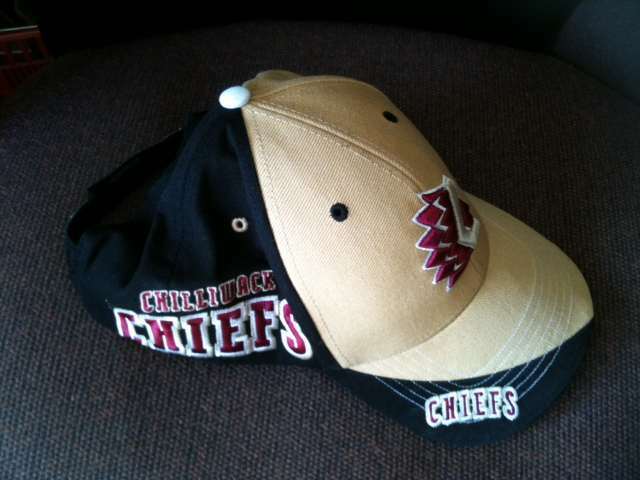 The Chiefs have back to back visits to Surrey coming up Wednesday and Friday. The next home game is Saturday night (7 p.m.) versus Prince George. Be the first to comment on "Chiefs Dump Silverbacks – Now On Six Game Winning Streak"